If there is one subject hunters seem to lose sight of, it’s an adequate understanding of the edge effect on whitetails. 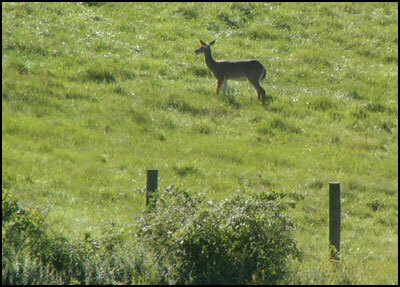 what makes up good deer/edge habitat. In fact, when I reflect back to my college days, I now understand why my professors drilled into me the importance of edge to wildlife and most importantly, deer. Hunters should know that understanding some basic edge effect concepts will make you more efficient in the woods and save you lots of time away from unproductive tree stands. Deer are the picture perfect example of an edge critter. By definition, an edge is the intersection of two different habitat types. Examples include where the woods meet the farmer’s crop field, the grassy bench on the side of a mountain or the utility right-of-way that bisects the forest. Edges also exist where three or more habitat types intersect, we call these areas corners. Take a moment to reflect upon your favorite deer stand. Chances are you have a lot of edge in the immediate vicinity. 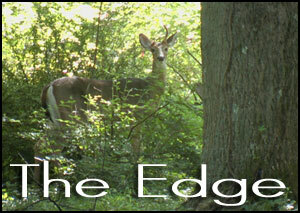 Although there isn’t many guarantees in life, I’ll personally testify that a deer’s favorite four-letter word is EDGE. It’s no secret to deer managers that whenever we manage for deer, the EDGE component is paramount to all successful deer management programs. Whenever we talk about the importance of edge, the father of wildlife management, Aldo Leopold states it best, “The variety and density of life is often the greatest along edges”. As a result of all the diversity along edges, many different types of plants grow there and thus, the attraction of our four-legged friends. Even 100 years ago, native Americans realized the importance of the edge effect and were, in fact, the first game managers. They accomplished this by burning areas within the virgin forests and prairies. Because the fire released important nutrients which were previously trapped in the soil, deer flocked around these burned-out openings to eat the succulent new growth. After the fire, the edges of these areas supplied deer with a diversity of food and cover. vegetative edge. For example, if your hunting area is an one square mile area divided into four equal compartments of standing corn, alfalfa, an oak/hickory forest and a swamp, you may ask yourself, “Where should I hunt?” If you truly understand the edge concept the answer should be directly in the middle where all the habitat types intersect. Why? This is where you maximize your vegetative edge/corner component. You should also realize that vegetative edges can occur naturally in areas hit by tornadoes, hurricanes, trees breaking under the weight of snow, or where an insect infestation may have occurred (i.e. gypsy month). topography edge. In mountainous terrain, examples include draws, hollows, benches, springs, valleys, saddles, peaks, etc. Wherever there is a change in elevation we have an topographical edge. If you hunt in an area where the landscape is flat such as the coastal plain, elevational changes may only be a few feet. Small rises of one to two feet can be very significant. Close observation will show that an one foot rise in elevation will most likely exhibit completely different soil types and different vegetation. A perfect example of topographical edge in flat areas are oak hammocks within a swamp. Whenever you maximize your vegetative and topographical edges chances are you will see more deer and interestingly enough, more scrapes and rubs. Although this discussion on vegetational and topographical edges may be an over-simplification and sound elementary, the firm understanding of the edge concept is paramount to all successful deer hunters. There is no doubt, knowing what to look for (edge) in relationship to deer and deer hunting takes work, but the benefits are many. Assuming you find the optimal vegetational and topographical edge area, “How can you maximize your edge effect even further?” Simply by creating more edge yourself. This can be accomplished by cutting a small path through a weed field or through a berry patch with a machete or weed-wacker. My hunting buddy, Steve Garbarino does this every year in the spring and then again, one to two months prior to the season opener. Although you might think this only opens up a travel lane, it can also produce a food corridor for deer to browse on prior to feeding in an open bean or corn field. One thing for sure, all the habitat modifications you perform today will pay many dividends in the years to come. In the long run, by creating more edge, you will benefit and like the old adage says, “All good things take time”! Even if you don’t have the means or time to create edge, knowing the importance of edge and what to look for in the woods will help you become a more efficient hunter.